This morning I had the chance to watch the new Robert Redford movie “The Conspirator”. It is a chronical of the trial of the Lincoln assassins with a special look at the trial of Mary E. Surratt. It was one of the best movies regarding the Civil War that I have seen in a long time. 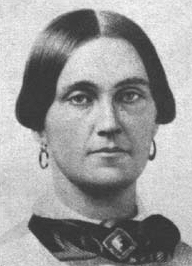 Mary Surratt as seen in the 2011 movie "The Conspirator". History is full of mysteries. It is also full of the evidence necessary to solve those intricate mysteries. The validity and constitutionality of the Mary Surratt execution is one of those puzzling mysteries. Was she or was she not privy to the plans of John Wilkes Booth, John Surratt, Lewis Payne, and George Atzerodt? Did she aide them in more ways than whiskey and “shooting irons”? That is something that only those present can know for sure, but we can take a look at what we know and make our own deductions from there. So lets take a look at what we know of her life previous to the assasination. Mary Surratt was born in Waterloo Maryland in 1823. Her family was strongly Catholic. Mary went to female Catholic seminary (Catholicism was looked down upon by many in America at that time, but that is for a different post). In 1853 mary married John Surratt. They had three children: Isaac, Anna, and John jr. In 1853 John sr. and Mary bought 287 acres of land in Prince George County Maryland. John built a post office and a tavern and called the new town Surrattsville. In 1862 John sr. died in 1862. For a time Mary ran the tavern after John Sr.’s death. Mary, in 1864 with Anna, moved to the now infamous boarding house that she owned on 541 High Street Washington DC. Could her background have led her to conspire with Booth? What do you think?